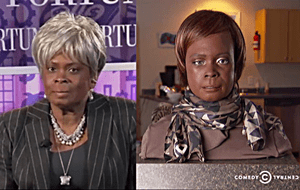 Stephen Colbert of the Colbert Report this past week included a explosive exposé of the the eventual upcoming black lesbian Nazi robot activist movement. Centered around an android created by Sirius Radio creator Martine Rothblatt as a machine-based representation of her wife, Bina. Citing robots like the Terminator, Colbert noted that “androids have always been soulless killing machines,” but now we should be frightened because they will “come fully uploaded with centuries of minority rage and resentment. Funny? Or cultural appropriation at it’s worst? Decide for yourself and leave a comment. If you can prove you are not a robot. The only thing that could make this more bizarre is when the FRC or Faux News start to take this seriously. No doubt Megyn (bleached blonde brain damaged) Kelly is already looking into this. FLESHBACK 1982 – Falcon Video Star Mac Turner – NSWF – 18+ Only!